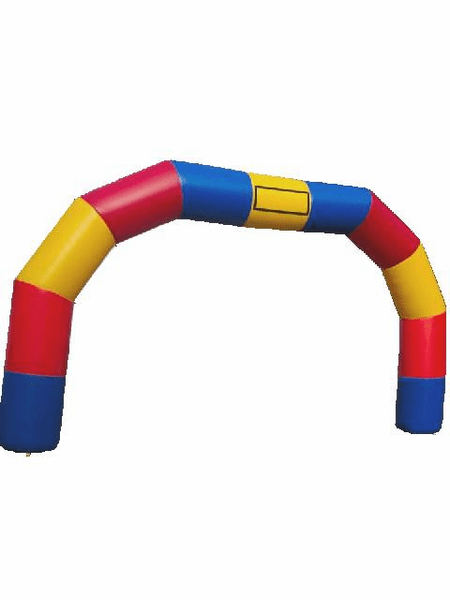 The Inflatable Arch can be used for a carnival entrance, water misting station for race time, game time, or half time. It's also great for big business events and sales. It's bright, fun look will grab everyone's attention. There are banner loops to hang a misting hose or rope lighting, or a giant banner under the arch. Big attention getter. We manufacture this inflatable arch here in the USA. We manufacture custom inflatable advertisments such as the inflatable arch. It's perfect for grand openings, big sales, or to just add a fun look to your place of business or wherever you set it up. The arch is a great advertising inflatable and because it's generic, it can be used for anything: holidays, sales, grand openings, new management, anything!